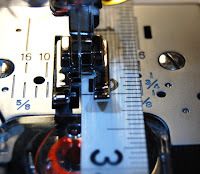 Keeping a perfectly straight seam is important to our final sewing results. I learned a long time ago to stop watching the needle. If you keep you eye on the needle, your final seam allowance will be off. If your machine has a graduated (numbered) plate, keep your eye on the measure you need or use a seam guide. To be effective, the guide can not move. If it has any wobble to it your seam will be off. Just a little bit can make a final difference. I use a long magnetic for much of my sewing. I place it for the correct seam and it is long enough to keep a perfectly straight, even seam. When finished, I pull it off. For a perfect 5/8" seam, place the tape measure sideways. Most of the 60" measures are a perfect 5/8" in size. Mark the spot! Then stitch out a straight seam and re-measure to make sure. Seam guides come in every shape and type. There are magnetic, screw on, and even adhesive. Don't have a seam guide? Use painters tape. 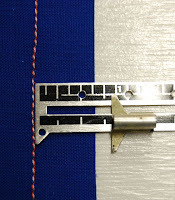 Use your tape measure and measure over, placing the edge of the tape where you need it. Use a rubber band. If your machine is a free arm put the rubber band around the arm. Place a sticky note where you need it. Want a higher guide? Stack up the sticky notes! Cut apart an old tape measure and tape down (take off the metal end). However you mark it, keep your eye off the needle! So a tape measure is 5/8 inches? Who knew? Thanks for the tidbit! The smallest things are fascinating to me! I found the 120 inch quilters tape measure is 1 inch.